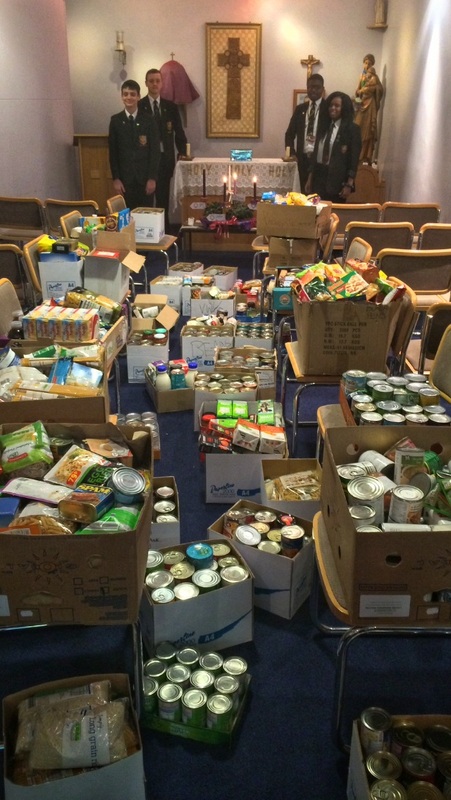 Bethany Community Outreach Food Bank is a charitable organisation within the local community of Erdington, providing life changing food hampers to the most vulnerable and in need people within the local and surrounding area. As we enter into this Year of Mercy, staff & students with the help of the Chaplaincy team at St Edmund Campion Catholic School, spent a week collecting items to donate to this great local service. A huge thank you to all members of the school community who worked tirelessly, sacrificing their break times and free periods to come together sorting, boxing & loading what was collected. The Food bank were incredibly grateful for the donation in excess of 1200 items which will greatly benefit some of the most vulnerable people in society. "We would like to say a very big thank you to all who contributed to the 1200 tins of food donated by St Edmund Campion Catholic School. As I am sure you are aware it makes such a difference to our customers"
The students really took the idea to heart; that individually they may not see immediately the difference such a small action will make, but collectively as a community they can make a real difference to someone’s life.